I should have written this one up several years ago and for that I apologize. Fugo is an interesting case where the Vet attempts to raise CUE but isn’t quite sure what he’s up to. In his bumbling efforts, he compounds his problems with interest and the whole thing ends up at the Court. They sort it out as they always do. Unfortunately for Joe, they untangled what decidedly was the worst legal mish-mash to arrive on their doorstep up to that point. How this ended up being a panel decision escapes me unless it was just to illuminate how a claim should not be handled. Let’s look at the particulars and sort it out for ourselves. I certainly don’t want to see any of you up at Indiana Ave. pro se in this predicament. Joseph F. Fugo, a combat Veteran, filed in 1987 for PTSD. I don’t think anyone can dispute whether he was entitled to this. The RO denied and he won on appeal. From the record, unless he was an accomplished actor, it’s patently obvious he was afflicted with severe mental issues. vA dissembled for a while and finally the Board gave him 70% for it. They stopped short of giving him the whole TDIU enchilada even though he’d burned through about 80 jobs over the years. His personal best was about 3 months before he hamburgered and went into self-destruct mode. 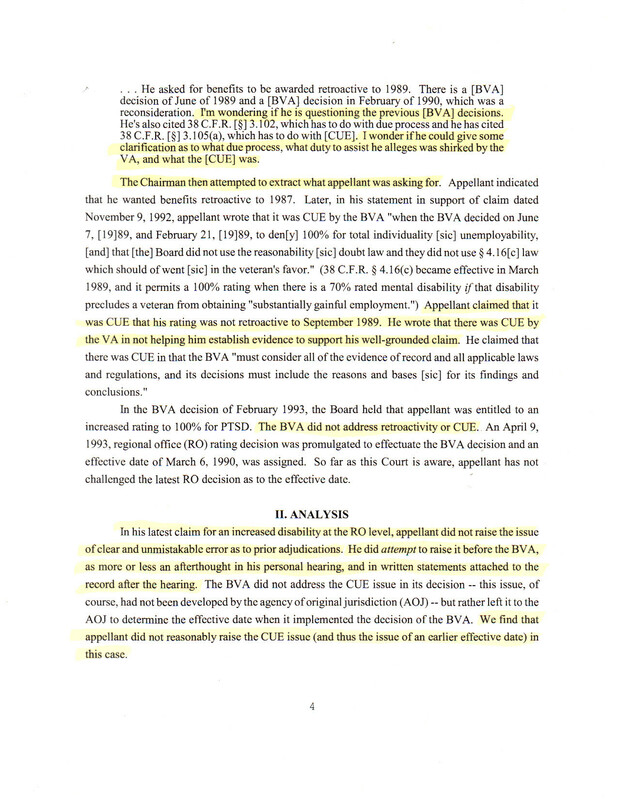 In June of 1989, Joe requested a Reconsideration of his BVA decision-something we rarely see or succeed in obtaining. Joe lucked out and an expanded Board panel of five heard his plea-or pretended to. Three rambling letters and an informal presentation to “connect the dots” later, he pancaked. The new panel declined to disturb the decision and determined there was no CUE. They used the phrase “no obvious error” which some can say is a way of dancing around the phrase “CUE”. Whether this was a true finding of no CUE is unclear. Fast forward to 1992 and a reopening for what I surmise was another attempt at TDIU. Joe’s VSO representative, a Mr. Hamer, attempted to couch this in terms of a CUE as well. What is clear from the Court decision is that even Joe’s own VSO was clueless as to what Joe really wanted. I reprint page 4 in its entirety to illustrate Mr. Fugo’s stumbling attempts with little or no assistance from those he entrusted this job. Click on it several times to enlarge it if you are visually challenged. This is a classic example of VSO help (or was) in that era. If you had one, he generally showed up about 30 minutes before any hearing to discuss the “game plan” with you. If you called him at the office, he was rather vague on procedures and had to get back to you. As you can see here, he actually arrived at the hearing without Joey and merely refers to him in the third person. The fact that Mr. Hamer didn’t have a clue what legal theory Joebob was espousing shows a serious disconnect-somewhat fatal to the case in this instance. It could be that Mr. Hamer was the DC representative of the VSO Joe had given his POA. If that was the case, this means Joe really got the shaft. Once armed with a POA, VSOs in DC tend to go into the beggar mode. Any semblance of backbone or intestinal fortitude disappears. Since you are not there, your protestations are inaudible. The Fugo case is classic theatre. The “You guys don’t know what you’re doing and if you did, we wouldn’t be here” was dragged out and found to be untenable. When you argue CUE, it should be a “Motion to Revise” all by itself rather than sandwiched into a TDIU increase claim. Mr. Fugo’s representative seems to have been about two blocks behind Joe and trying desperately to catch up. I find this more often than not where VSOs are concerned. There are many able-minded VSO representatives out there so don’t let this stand as an indictment of all of them. However, no one can argue that what we are reading here is not indicative of a claim heading towards derailment a year or more before it saw the light of day at Indiana Ave. NW. Nevertheless, in 1993 the BVA did grant 100% TDIU to Joe and gave him his 1990 filing for increase which was equitable. That didn’t sit well with him and he proceeded to file the NOA. It appears he dropped Mr. Hamer off at the VSO HQ on the way since the decision reflects he stood before the Boys pro se. Baaaaaaad idea. Very bad. Vets as a class of human beings are incredible self-starters. We were taught that concept in the service. “Make do with the assets at hand” was a mantra expounded from Day one. Mr. Fugo decided that was the best course of action without doing much research. He obviously had a rudimentary knowledge of Part 3 and 4 of 38 CFR, but that isn’t good enough at the Court. I fully understand Mr. Fugo’s frustration in retrospect. I have experienced the same sensation when filing NODs, replies to SOCs and F-9s. It would appear that everything you list or enunciate flies in one ear and out the other. Each carefully constructed argument with clear reasoning and evidence is ignored and the RO poobahs take off cross-country like a dog chasing a cat while still chained to the dog house. After fighting twenty three years and finding myself in similar straits, I have decided to employ an attorney and see if he can get a straight answer. My technique hasn’t worked very well as yet. My Motion to Revise my back decision was carefully constructed to avoid what Mr. Fugo encountered. Every error I perceived was examined closely and followed by a rational discussion of why it was error, the specific error with respect to CUE law, and how it would have been manifestly different had they not erred. Each reason was ignored and the decision, in essence, was a retread of the 1989 logic. At no time was there any discussion of the errors I pointed out. Its difficult to have a meaningful conversation where ex parte judicial methods are employed. This is why we have hearings. Unfortunately, if your VLJ or DRO hearing officer is simply whiling away the time and waiting for an end to your passionate entreaty, nothing of substance can ensue. 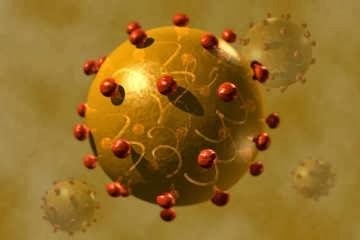 The RO and the BVA are triers of fact. If they cannot or will not listen to your arguments, no meaningful justice is accomplished. You report-they decide. You rebut-they decide. You appeal-they send it to DC and decide. In the end, the CAVC examines it properly and about that time, the vA decides to look in earnest and asks for a Joint Motion to Remand (JMR) to come up with a better denial mousetrap. Mr. Fugo’s arguments didn’t begin to rise to a meaningful discourse and that is why this ended up on the rocks. It appears he was not on the same page as Mr. Hamer (or vice versa). Let this illustrate further what happens when you send someone off to do your bidding in a legal matter and they have no grasp of what you are arguing. Where CUE is concerned, this is inevitably fatal. The one thing Mr. Fugo should have been able to take away from this was a dismissal without prejudice. This would allow him to refile his CUE claim on the same grounds if he or an interested lawyer wished to. I don’t see anything that would lead me to believe he could prevail, but then again I’m not schooled in this. Mr. Fugo and his pro se attempt at justice: Fugo_93-407a. Read ’em and weep. 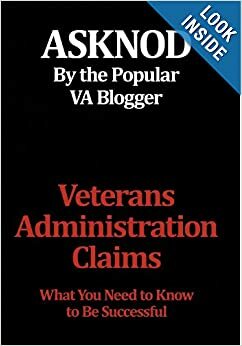 This entry was posted in CAVC/COVA Decision, CUE, Veterans Law and tagged asknod.org, asknod@wordpress.com, CAvC/COvA Decisions, CUE, DIY vA Claims, Gulf War Claims Help, Help with vA Claims, Helping Veterans, Service Connection, VA claims, VA CUE INFO, Veterans claims help, Vietnam Veterans Claims Help.. Bookmark the permalink.